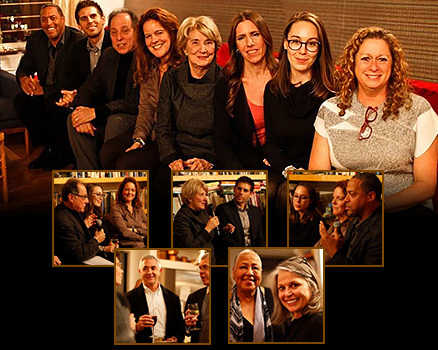 In partnership with Michael Kimmel and The Center for the Study of Men & Masculinities featured a panel moderated by Marianne Schnall and Michael Kimmel with Chloe Angyal, Abigail Disney, Carlos Andrés Gómez, Don McPherson, Esta Soler, and Niobe Way, this salon, hosted at the home of Abigail Disney, asked us to think about working together to support the changing paradigm of men and women's roles, and also announced the launch of the Men & Women as Allies initiative. Like our second event in this series, "Women & Men as Allies: At Work and at Home" and previous FemSalons on the State of Feminism, Women & Money: Re-imagining Economics, Women & Peace, and Our Inner Lives, the room was filled with incredible people, including members of the Feminist.com board and advisory board, along with many longtime friends, supporters and colleagues. Special thanks to Abigail Disney, Feminist.com sponsors Awakening Voices, Willa Shalit, Christianne Disend, Maiden Nation, RTM Limited LLC and our celebrated speakers. Visit the Women & Men as Allies main page for more about this initiative and other events in this series. Stay tuned for more information about our plans for future events and comprehensive Men & Women as Allies microsite and how you can support our work. The Center for the Study of Men and Masculinities The Center for the Study of Men and Masculinities was founded in 2013 at Stony Brook University — the first such center on the world dedicated to exploring men's lives and engaging men and boys for gender equality. Our mission is to foster a dialogue between researchers and activists working to engage men, and to inspire researchers to provide activists with work they need to be more effective. The Center runs seminars and develops activist-based research projects, and is planning a major conference in New York City in March, 2015. And as always - thanks to all who joined us at the event! It was an inspiring evening and we were so happy to share it with our friends, colleagues and supporters. This event was the launch event for Feminist.com’s "Women & Men as Allies" initiative. Stay tuned for more information about our plans for an ongoing event series and comprehensive Men & Women as Allies microsite and how you can support our work. On October 7th, 2015 we had our 2nd event in this series: Women & Men as Allies: At Work and At Home: A conversation about how women and men can be allies in the efforts to balance work and family. The event featured a panel discussion with Jessica Bennett, Simon Isaacs, Alicia Jay and Josh Levs moderated by Marianne Schnall and Michael Kimmel. Supported by the Woodcock Foundation. See an album of pictures and video from the event on the event page.